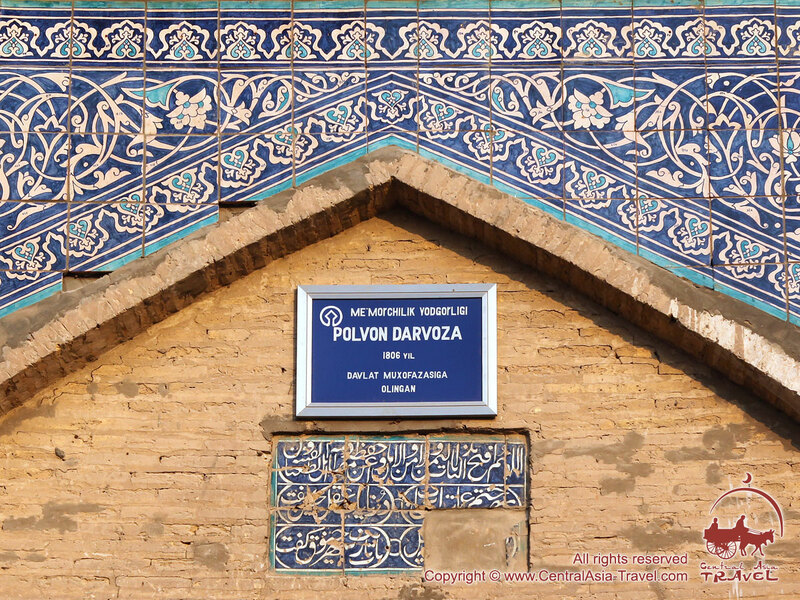 Palvan-Darvoza Ensemble. 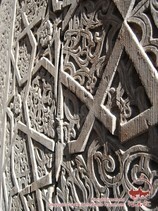 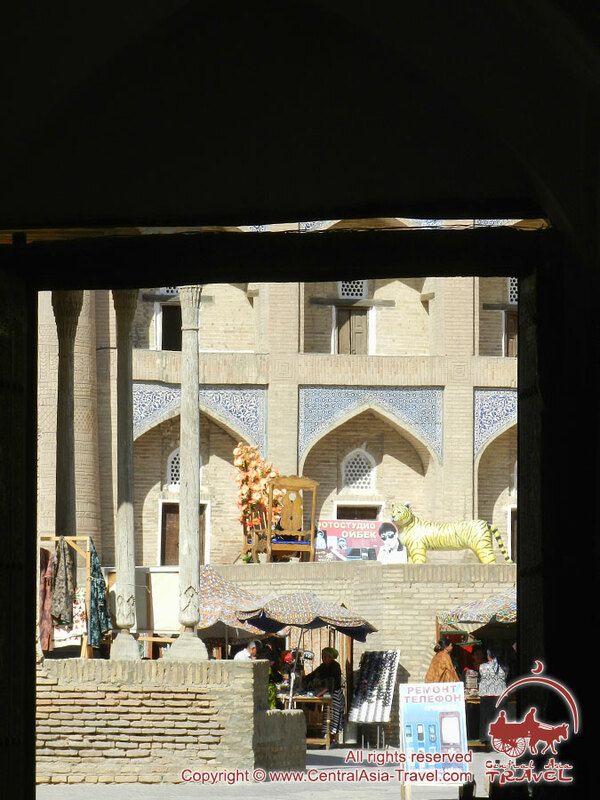 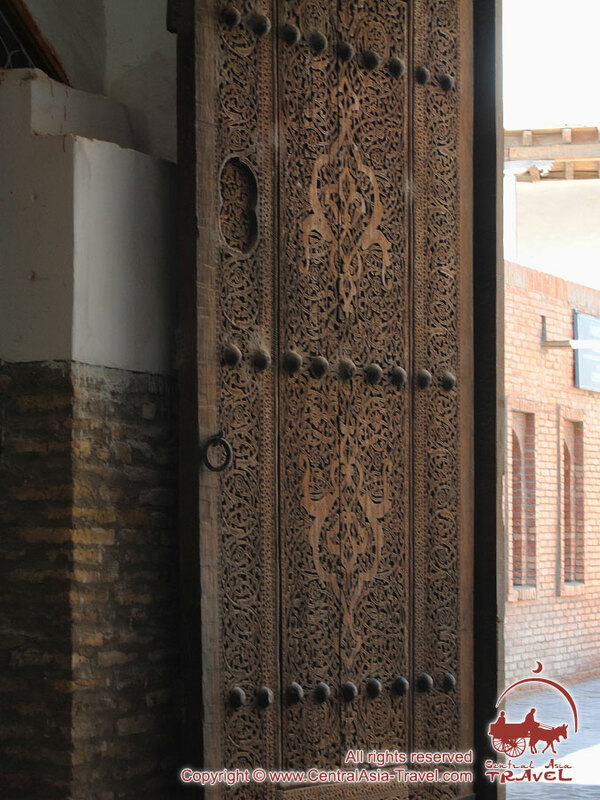 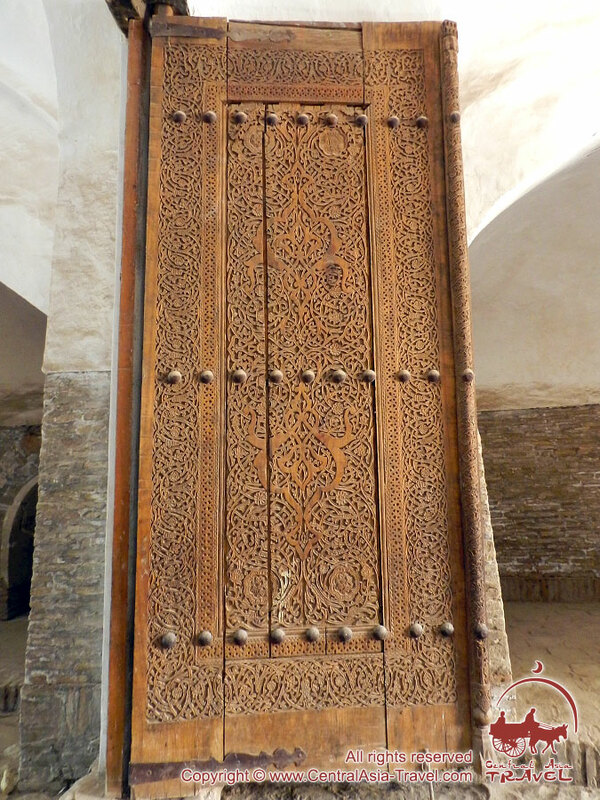 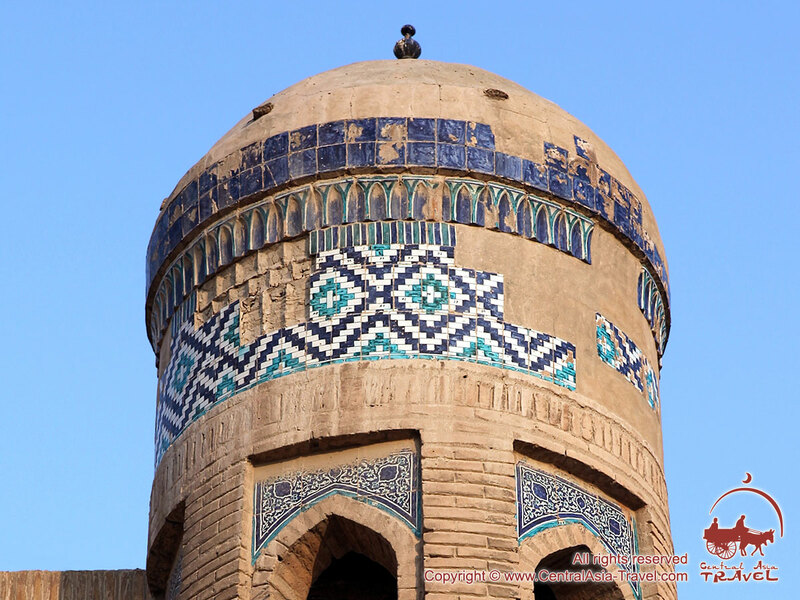 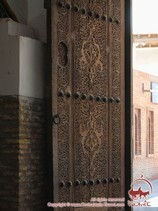 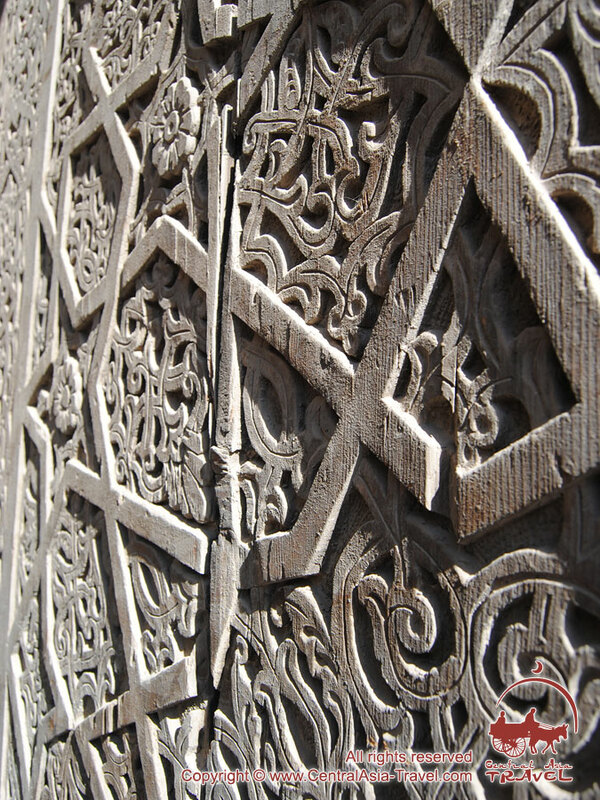 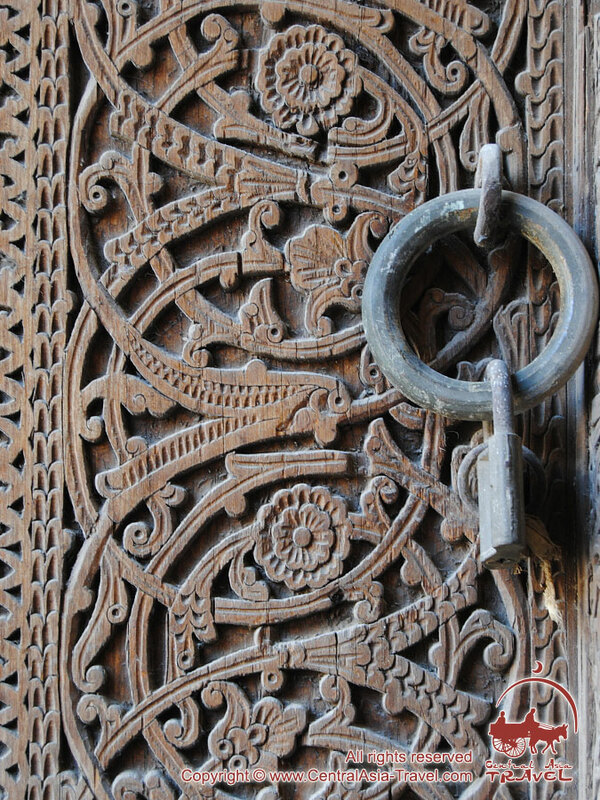 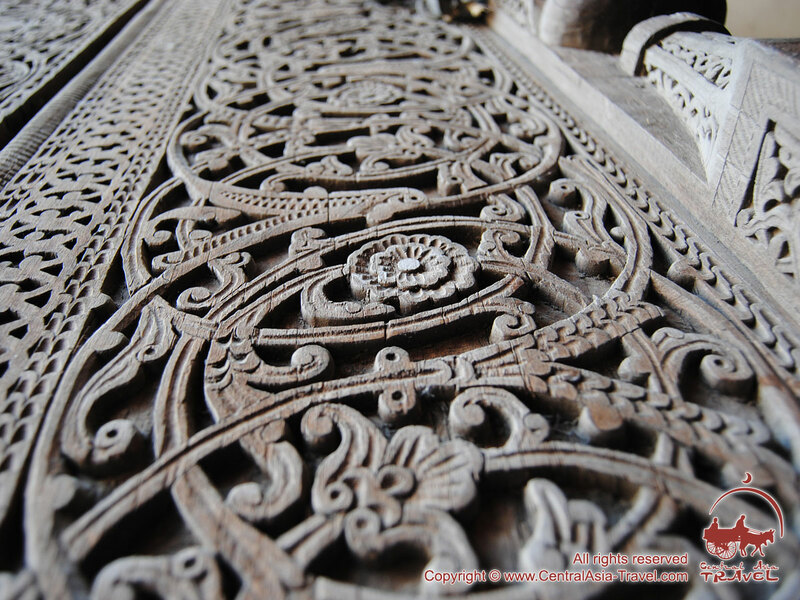 Remarkable sights of Khiva. The square Palvan-Darvoza (‘great gate’) at the eastern Ichan-Kala gate is, perhaps, the busiest Khiva place. 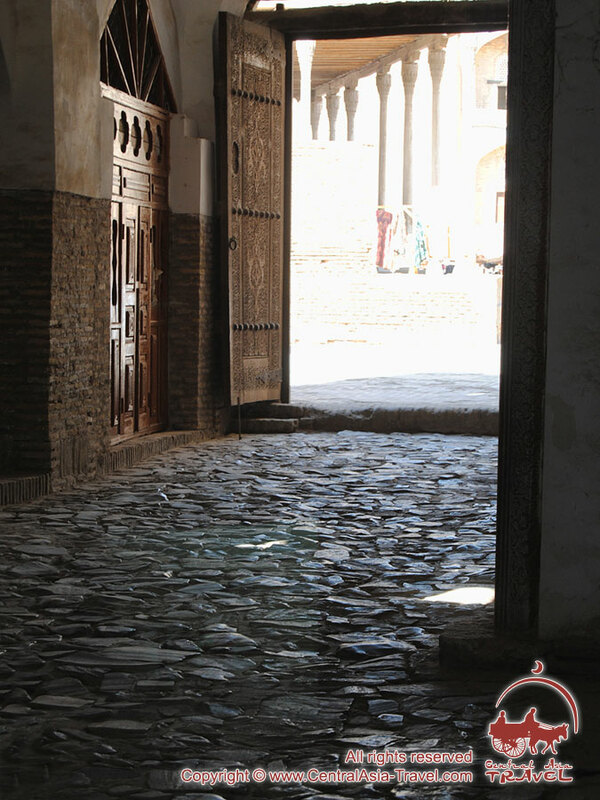 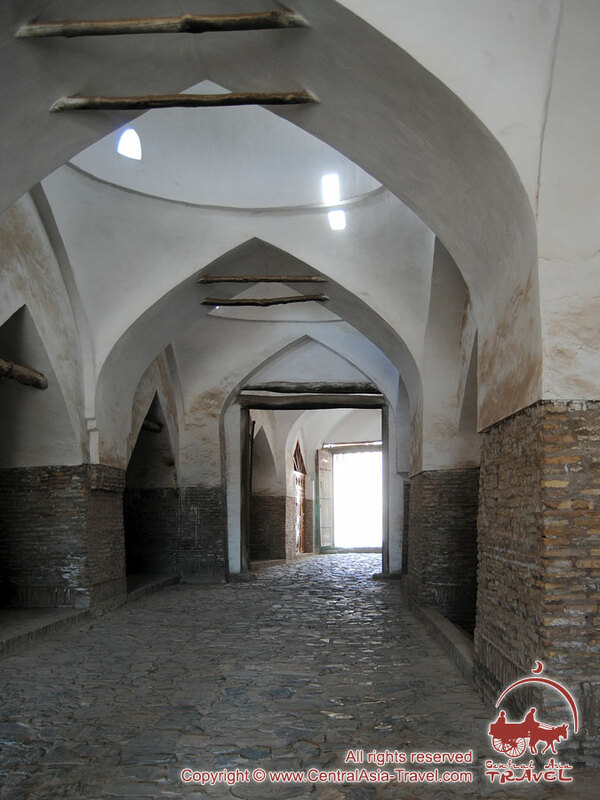 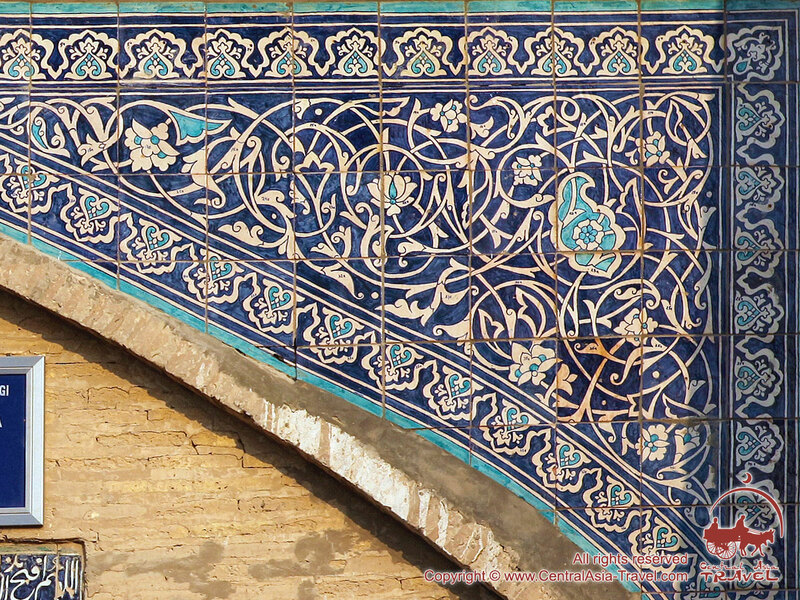 It features a lot of old structures: Anush-Khan Bathhouse (its foundations were laid in 1664); one-storey Hodjamberdybiya Madrasah (1688), Allakuli-Khan Madrasah (1834 - 1835), the roofed bazaar Tim (1836 - 1838), Allakuli-Khan Caravanserai (1832 - 1833), and Kutlug-Murad-Inak Madrasah (1804 - 1812). They were built one by one when it was necessary for them to appear. 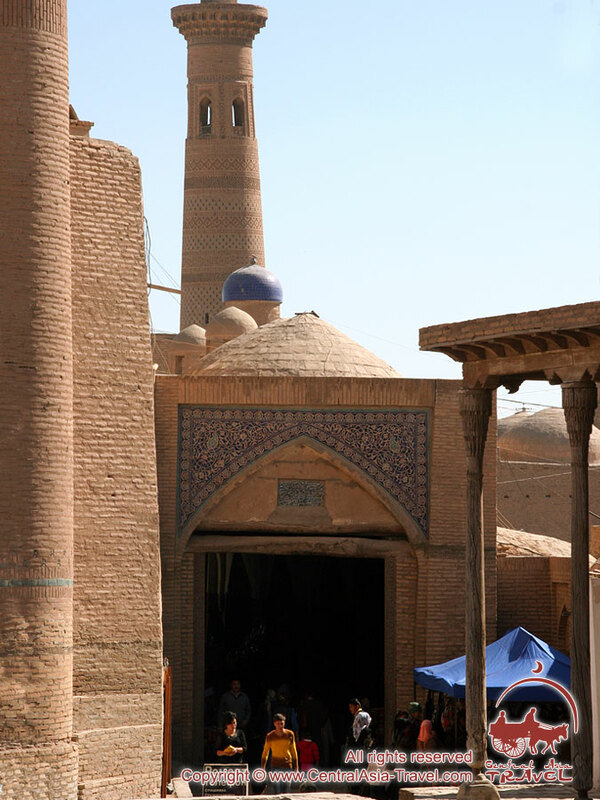 Since new buildings were always needed, some of them extended outside Ichan-Kala. 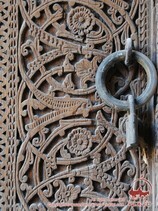 All of them feature exquisite decoration and shape. 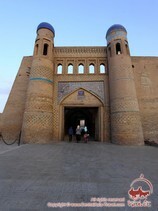 Palvan-Darvoza Gate was built in 1804 - 1806 and has the shape of an arched portal with an inscription above the entrance. 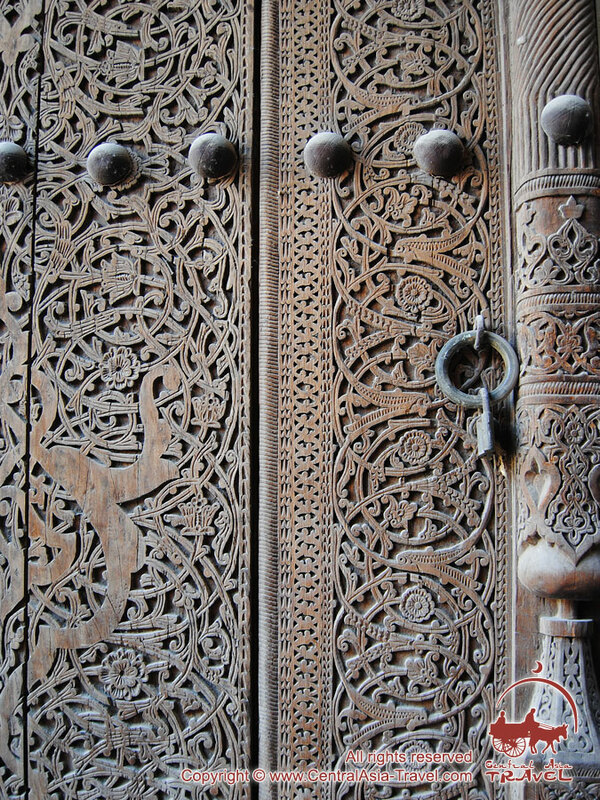 It says Shakhri Khiva (‘the city of Khiva’) and shows 1806 - the year they completed the construction of the gate. After the entrance arch there is a vaulted trade gallery with merchants’ shops on either side. 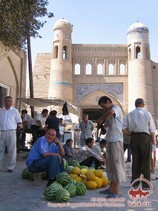 At the exit from Ichan-Kala and to the right of Palvan Darvoza Gate there had been a slave market till 1873. 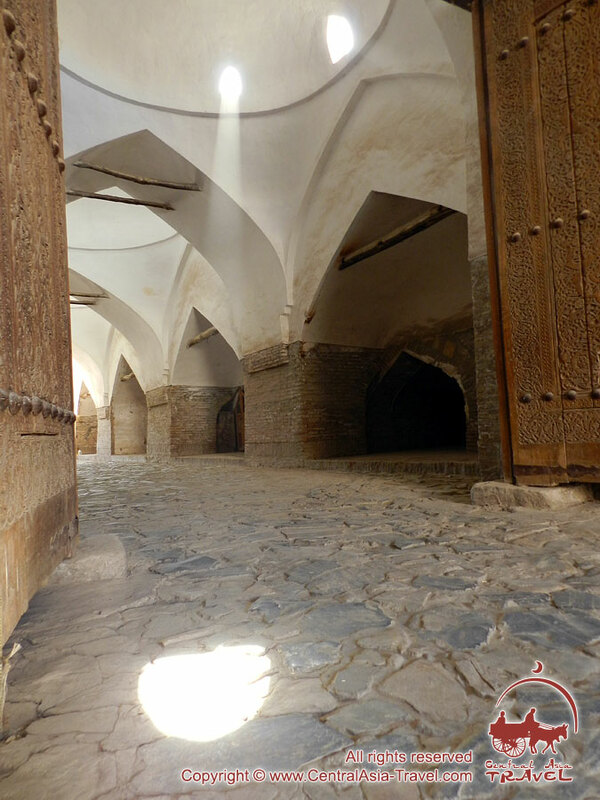 This place was also used for announcements of the khans’ decrees and execution of criminals, which was the reason why people called the gate Kul Darvoza (’slave gate’) and Pashshab Darvoza (‘execution gate’).